Bluff Squeezes focuses on the art of using the squeeze play as a bluff (or "light squeezing"). Makes sense. A bluff squeeze in action; UTG+1 raises, MP1 calls, Hero 3bets. This a screenshot from the first part of the vid. If you've watched a handful of "session replay" training videos you've almost certainly seen a few bluff squeezes thrown around effortlessly in various preflop spots. But how do you know if you're in a good spot to pull it off exactly? When is it +EV to go for it? When should you bluff squeeze? Who should you bluff squeeze? How important is position when using the squeeze play as a bluff? How much should you raise when bluff squeezing? How do you play postflop if called? ...and a lot more questions related to the tricky bluff squeeze. No stone is left unturned here – not even the ones that look like they probably have an army of fire ants raging underneath. This training video is an impressively thorough guide to the strategy behind a good bluff squeeze. If you're completely new to the squeeze play, or if you've heard of it and want to find out how to use it more effectively, you're in for a treat. 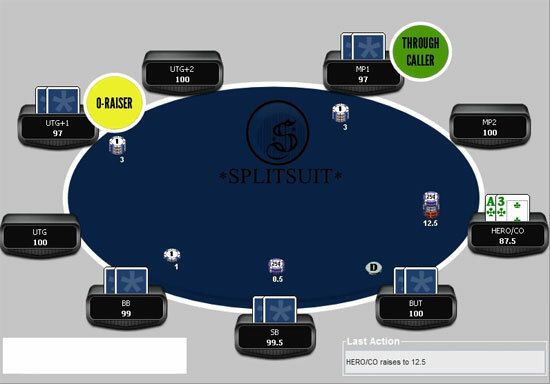 Just as Split's isolating video is an all-in-one guide to isolating players preflop, this is the all-in-one guide to using the squeeze as a bluff. (0:58) What is a squeeze? (26:08) Hand 1 - Squeezing with KTs in the BB. Through caller on BTN calls. Q54r flop. (27:34) Hand 2 - Squeezing with Q9s in MP1. Through caller in MP2 calls. AJ3 flop, we fire a cbet. (29:11) Hand 3 - Squeezing with KJo in CO. O-raiser in MP1 calls. K87 flop.